For years I’ve tried to imagine the layout of my grandparents’ home as I heard my Dad tell me stories of growing up and as I looked at the family photos. For some reason I always found it difficult to imagine. A few years ago I found a way to easily draw a floor plan and place the photos into that floor plan. This helped me understand the arrangement of my grandparents’ home. While there are several software programs available, I settled on using floorplanner.com since it is browser based and free. It is easy to use although the free version does not allow me to share it as I would like. My 10 minute video below shows how using floorplanner.com has helped me understand the progression of changes to my grandparents’ home in the pipe yards at Singer Pipe and Supply during the time period they lived there. The video focuses on the house floorplan and progression. 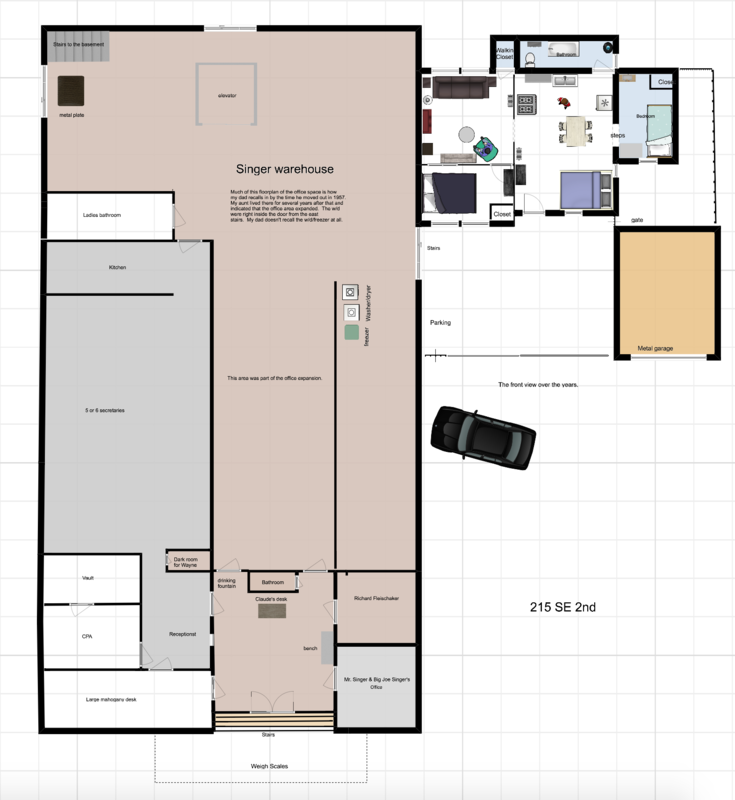 This week using my dad’s and aunt’s recollections I expanded the warehouse floorplan and updated the house a bit. My dad and/or grandpa shot some footage that not only shows the outside of the Singer home but shares with us some of their activities such as family visiting, delivery from the milkman and a snowball fight. It’s much easier to appreciate the warehouse, the pipe yards, and the home now that I have a better perspective of the floor plan and area. Knowing the surroundings is another important element to understanding the neighborhood. 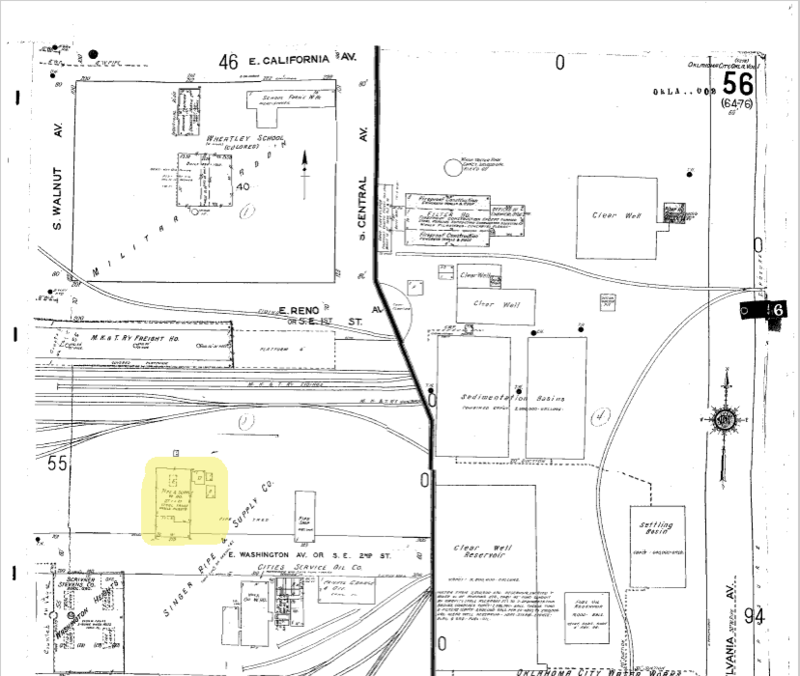 The Sanborn Map ca 1955 (available online at http://www.metrolibrary.org) shows the location of the Singer Pipe & Supply Company and house. The area is completely changed today and, in fact, it’s almost difficult to imagine anything could have been there especially a home. To determine the placement, I found that the U-Haul building was originally built in 1912 and was the National Biscuit Company at Compress and SE 2nd. According to the map for today, that places the Singer building approximately where the Harkins Theatre is. In the map below I overlayed the portion of the Sanborn map of the Singer building on a map from today to show approximatley where it was located. The Singer Pipe & Supply company house located at 215 Washington (later 2nd St), Oklahoma City, OK. This animated gif shows how the house evolved using a photo from 1938, 1941 and 1955. It was fun to do! Thank you for visiting.